Time for new Field Guides? 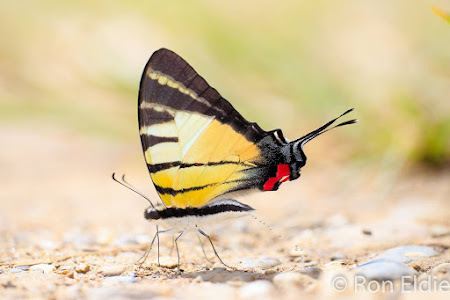 A visitor from Europe recently left me an email to inquire about local references and literature about South East Asian butterflies, and in particular, Borneo where he planned to spend a week. Whilst I was able to point him to several decent works about butterflies in the region, I was quite hard-pressed to refer him to good field guides about Bornean butterflies. 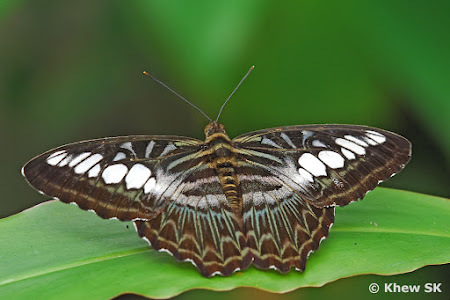 Continued searches on the internet, good nature book stores and amongst like-minded butterfly enthusiasts did not turn up anything other than what was already currently available. A map of Borneo island. The island of Borneo is the 3rd largest island in the world. 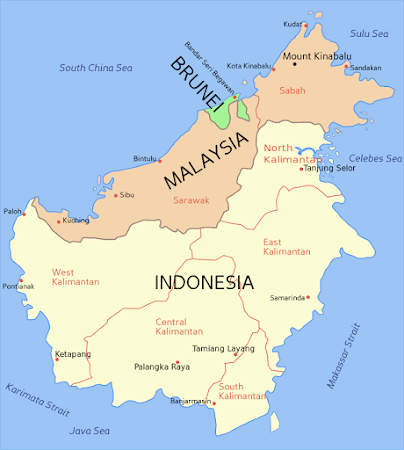 It is politically divided among three countries: Malaysia and Brunei in the north, and Indonesia to the south. The island covers 751,936 sqkm (that's more than a thousand times the size of little Singapore!). About 73% of the island is Indonesian territory known as Kalimantan. In the north, the East Malaysian states of Sabah and Sarawak make up about 26% of the island. Additionally, the Malaysian federal territory of Labuan is situated on a small island just off the coast of Borneo. The sovereign state of Brunei Darussalam, located on the north coast, comprises about 1% of Borneo's land area. Borneo has extensive primary rainforest cover that is believed to be over 140 million years old, making it one of the oldest tropical rainforests in the world. In recent years, infrastructural development, logging and oil palm plantations have continued to decimate the natural rainforests. In the past decade, severe massive forest fires further reduced pristine rainforests to ashes. 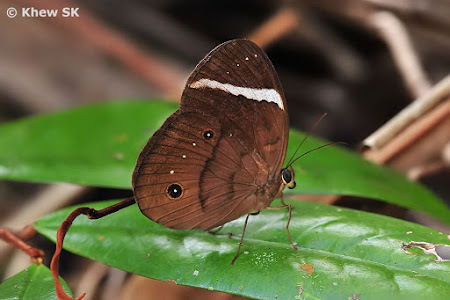 The island is home to a large number of endemic species, and the number of species new to science cannot be underestimated as researchers rush to document Borneo's rich biodiversity. There are nearly a thousand species of butterflies that have been discovered in Borneo. Of these, close to 10% are endemic to the island - meaning that these species are found only on Borneo and nowhere else in the world. Over the years, species new to science continue to be discovered as previously inaccessible parts of the rainforest are opened up. Mount Kinabalu in the state of Sabah, is the highest peak on Borneo, rising to 4,101m. There are many endemic montane species of flora and fauna found in Borneo. One of the best taxonomic references on the Butterflies of Borneo is the out-of-print Butterflies of Borneo, Vol 2 No 1 Lycaenidae (published in 1991). 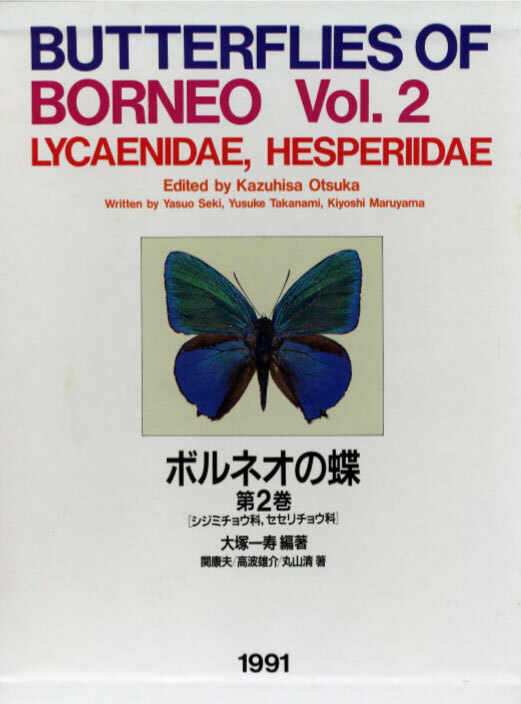 However, this book only deals with the Lycaenidae species in Borneo, whilst the elusive Vol 2 No 2 covers Hesperiidae. Another book by the same author Kazuhisa Otsuka, is a 224-page hardcover Field Guide. 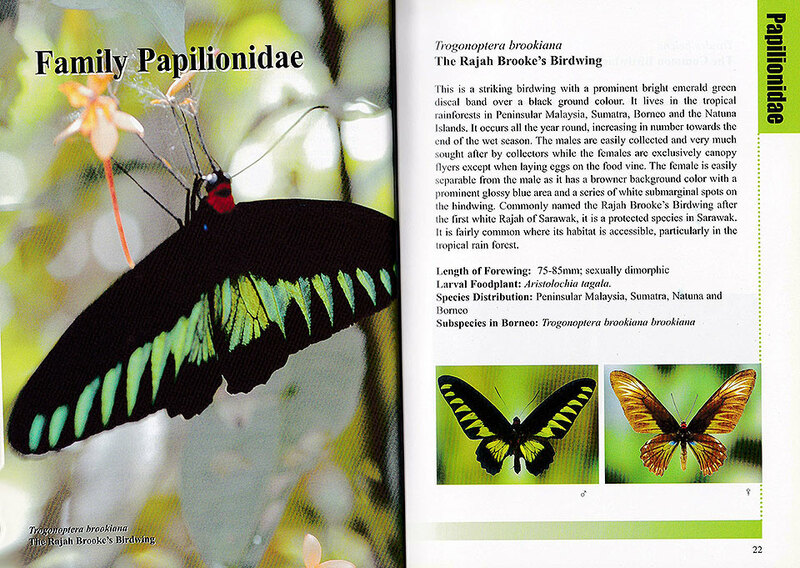 A selection of about 200 species of butterflies found in Borneo is featured in the book. The book is rather short on the introduction of butterflies in Borneo and taxonomic details about butterflies. Searching for species in the usual organised taxonomic families is difficult, as the author organised the book by habitats. 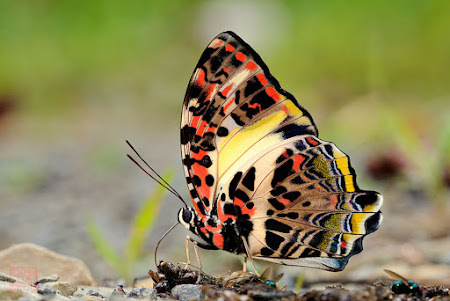 Even the index to the species pages are ordered by habitats and there is no easy way of searching for each species alphabetically, either by scientific or common names. 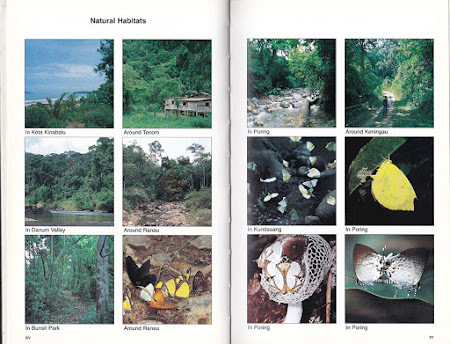 Although meant to facilitate easy reference to the species found in their natural habitats, it is extremely difficult to navigate the book to look for a particular species, as many species have overlapping habitats. 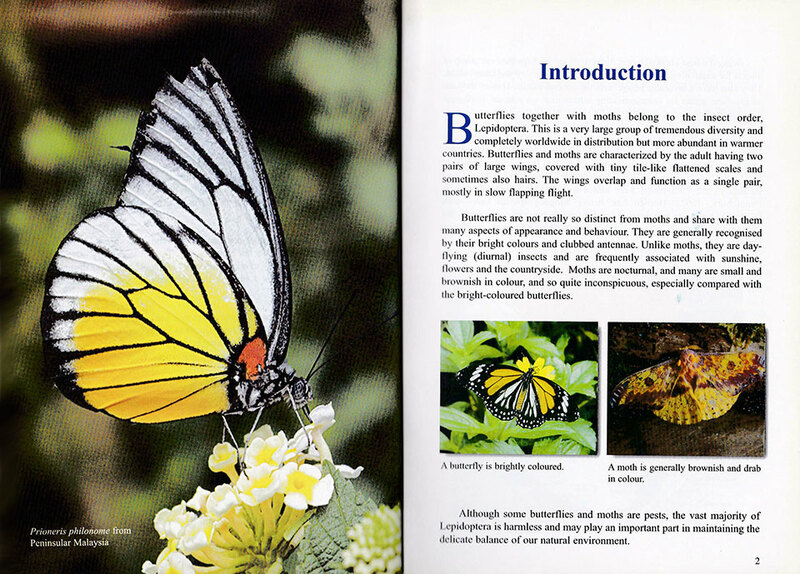 This makes the book less useful as a field guide to the less experienced butterfly watcher. 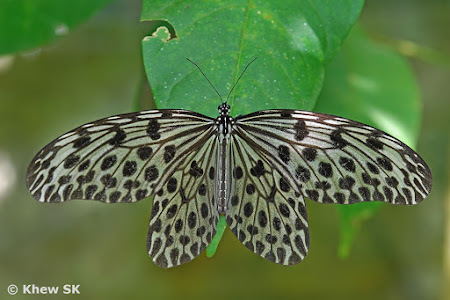 The author has also chosen to coin new English common names for quite a number of the species featured in the book, which are totally unfamiliar across the available literature on South East Asian butterflies. This makes the search for different species by their common names even more challenging! 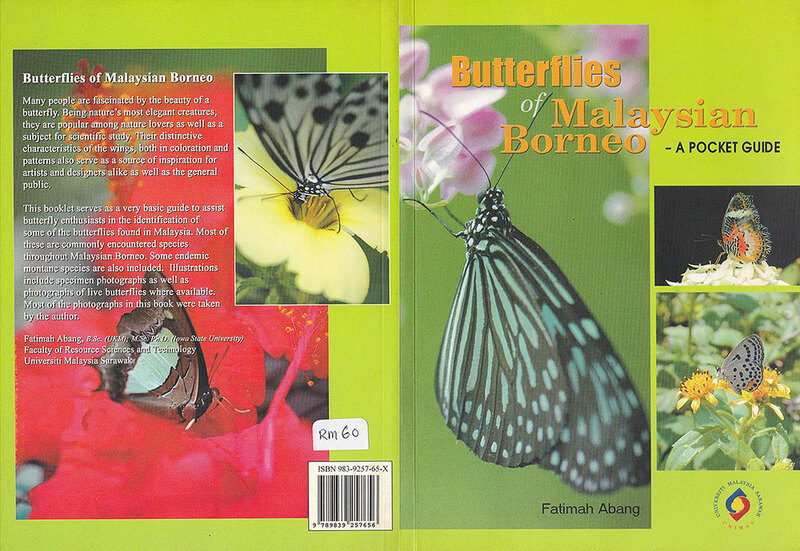 A second book, referred to as a "pocket guide", is a 130-page paperback by Fatimah Abang, a Professor in Entomology from Department of Zoology of the University Malaysia Sarawak. 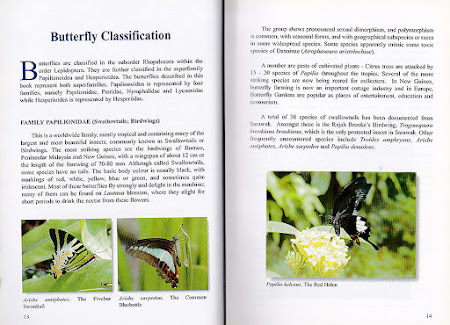 This book is intended to serve as a very basic guide to assist butterfly enthusiasts in the identification of some of the butterflies found in Malaysia. This book, entitled "Butterflies of Malaysian Borneo - a Pocket Guide", showcases a total of 100 species of butterflies. The first 20 pages of the book starts with a useful introduction to butterflies and explanation of some of the various aspects of their habitats and host plants, morphology, life cycle and classification. 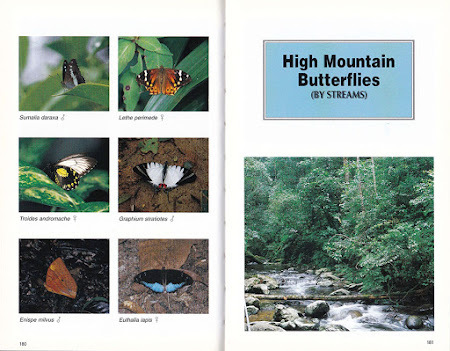 The rest of the book is organised by the families of butterflies, albeit the photos of the species are from museum specimens and very few field shots are found in the book. A useful index can be found at the end of the book, which aids in the search for species pages found in the book - by alphabetical order of their scientific and common names. 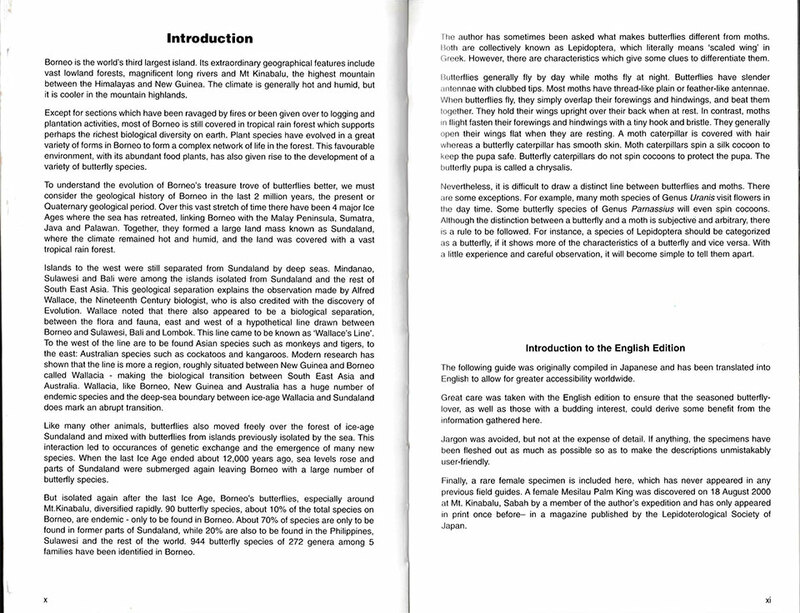 Some of the English common names used in the book may have been influenced by the author of the previous book and appear to deviate from the typical names used by authors in the region. 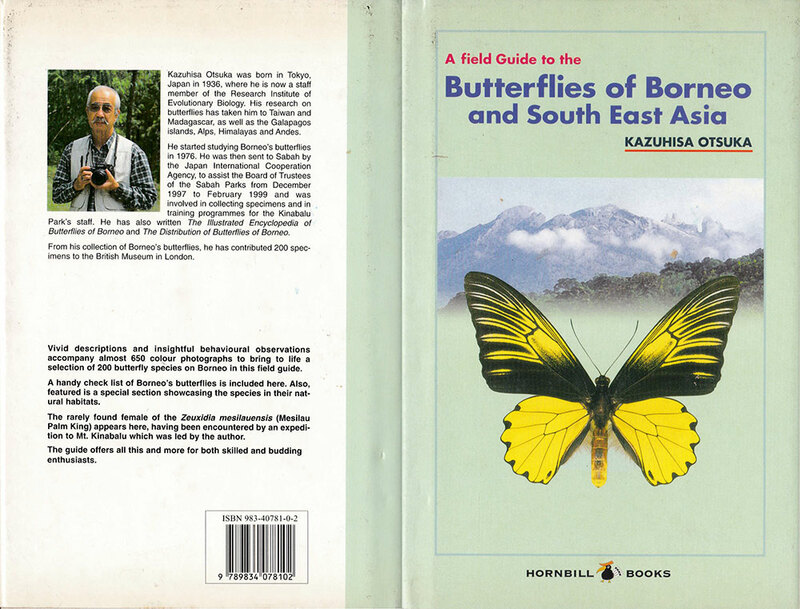 Whilst both these field guides on Bornean butterflies may have their shortcomings, they are nevertheless the only currently available books dealing with species found in Borneo. 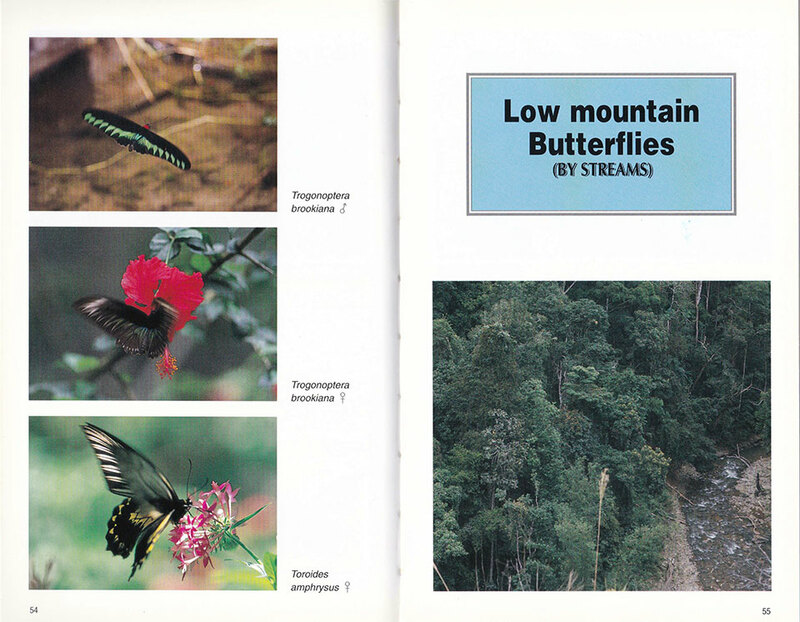 This leaves a big gap in the educational literature about the butterflies of Borneo for other authors to fill. At the moment, Beaufoy Publishing has indicated that a 'coming soon' 150-species Butterflies of Borneo book is in the works. 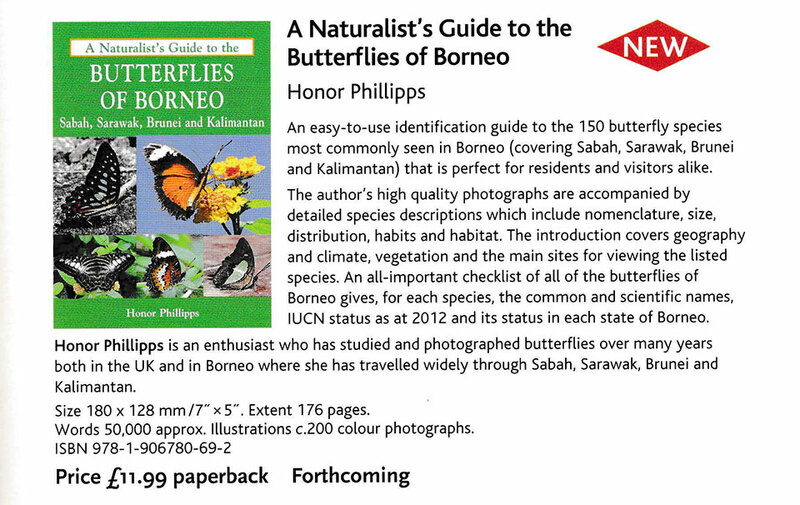 Authored by Honor Phillipps, the book is described to contain the full checklist of the butterflies of Borneo as at 2012 and their status in each state of Borneo. However, a quick check on the internet websites show that this book is still yet to be available. Friends in the photography groups have also indicated that another book is also in the works. This book, will be published by renowned publisher of all things Borneo, Datuk Chan Chew Lun who owns the Natural History Publications (Borneo) Sdn. Bhd. a Kota Kinabalu-based publishing house. 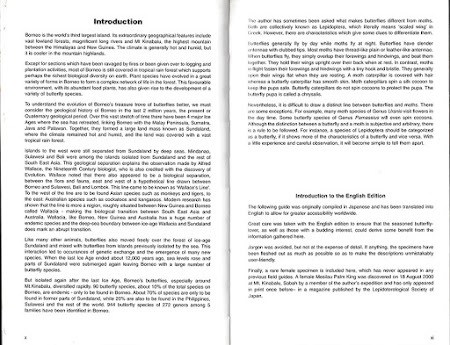 It is one of the leading English language and natural history publishers in Malaysia and Southeast Asian region. The company has published numerous works relating to the biological richness of the region, with a focus on the island of Borneo. Butterfly enthusiasts will certainly look forward to these new publications on the Butterflies of Borneo. 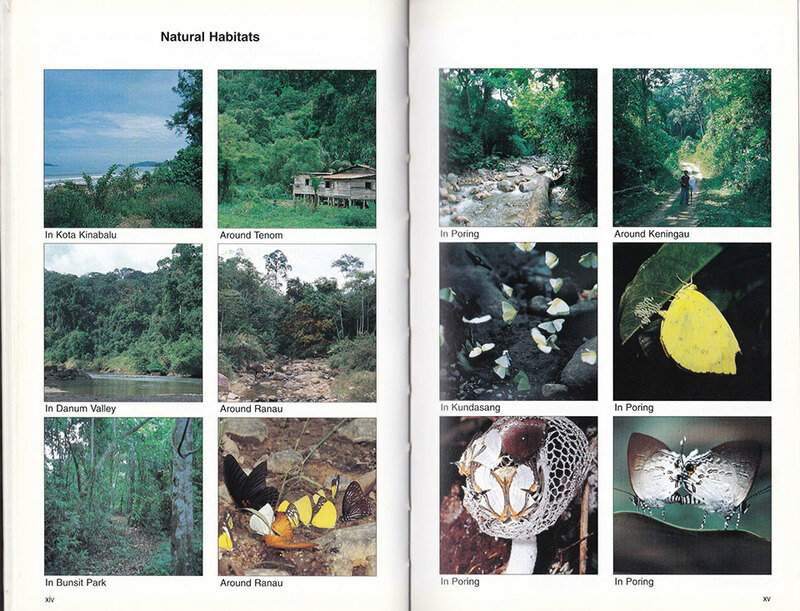 Photos from the books "A Field Guide to the Butterflies of Borneo and South East Asia" and "Butterflies of Malaysian Borneo - A Pocket Guide" are copyrighted property of their respective authors and publishers, and samples of the pages from the books are featured here under the principles of fair use.